Hi... Bloggers Did u recognize this LOGO....??? ......??????? 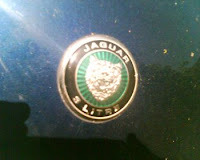 Yup Right this is JAGUAR Yup that logo so familiar with our eyes right.. Jaguar one of the speedest car in the world and cost in luxury prices. 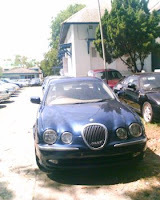 And one thing is to be wonder that this luxury car is not sale in big and luxury showroom or car plaza like what we see in the developed country, this kind of luxury car in sabang was put on sale in open air garage without any roof to protect this car for sunny sun or rainy season. 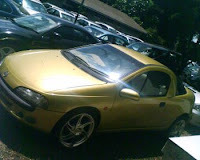 This car was sale on very discounted prices, its about 1/2 or even 1/4 from the original prices of da factory excluded tax yet. Is this market legal...??? 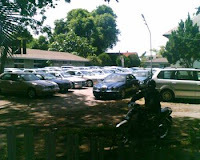 Yup as well as you are paying a tax and deal in car license with the local police department special Transport ..You Luxury Car are Allowed to be anywhere in Indonesia. 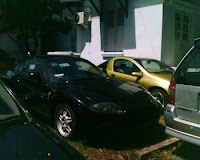 So when u buy one of this car from Sabang and would like to take it home dont worry about the delivery, coz Indonesian Military for Special Air Force base there could helping u carrying this luxury car to ur garage at home. So Cash ur credit card fly to sabang when u get back home carry one of the luxury car, but dont forget to take a first track with ur new luxury car around Sabang Island as a Thanks Giving. I Wish.....I Could Have One...!!!!! And what can you say about these luxury cars?